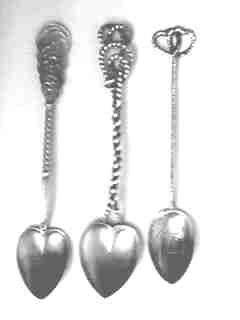 The tradition of giving a spoon to one's lover is very old. 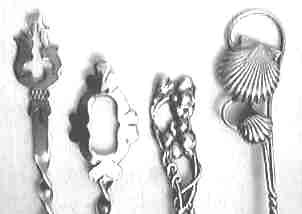 The Welsh and Norwegians have museums of old carved wooden spoons which young men would create as presents for the young ladies which they were courting. 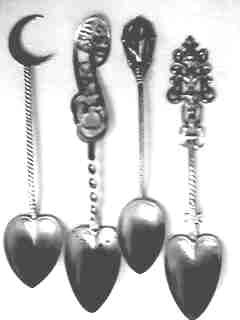 Reproductions of these old wooden spoons are readily available. 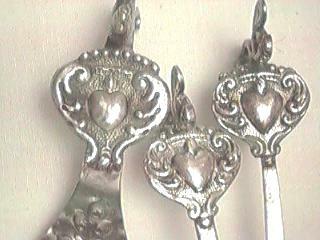 But since this is a sterling silver spoon page, I felt obligated to show only silver spoons in the love "genre". 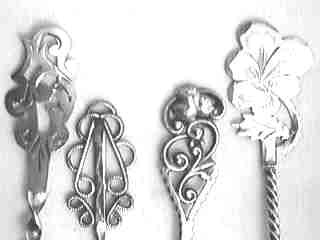 Although these spoons were probably not made by the young man they are obvious derivatives of that tradition. 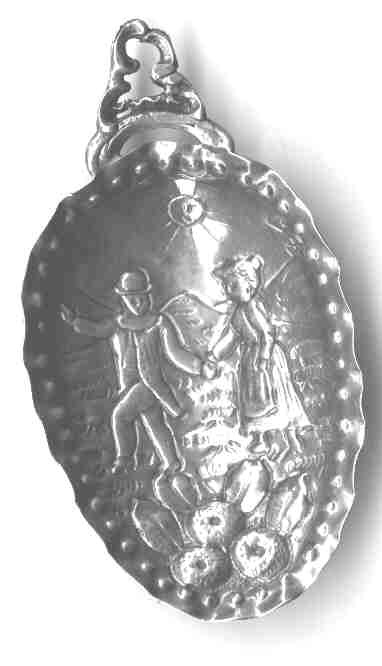 Dutch caddy spoon showing a man and woman courting. 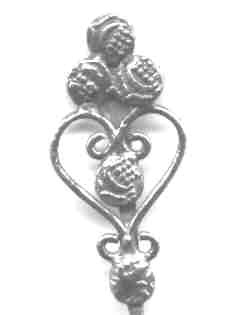 Cute handmade love spoon with a heart and strawberries. The bowl is shell shaped. At this point in history, strawberries were considered to be a delicacy. Unmarked, but I think it is sterling. ¬Commentary: Cologne was founded and established in Ubii territory in the first century AD as the Roman Colonia Claudia Ara Agrippinensium, from which it gets its name. "Cologne", the French version of the city's name, has become standard in English as well. ¬Finial: Johann Maria Farina gegenüber dem Jülichs-Platz (English: John Maria Farina opposite Jülich's Square) is the world's oldest eau de Cologne and perfume factory. It was founded at the beginning of the 18th century by Giovanni Maria Farina (German: Johann Maria Farina), an Italian perfume maker who started his business in 1709. The company's logo is a red tulip. 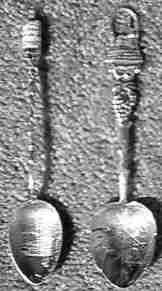 The French name "Jean Marie Farina vis à vis de la place Juliers" and the short form "Farina gegenüber" were also commonly used over a long period of time. 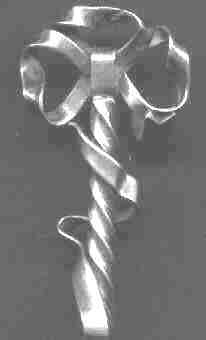 The company is still run by the founder’s descendants, who are the eighth generation of family members. " 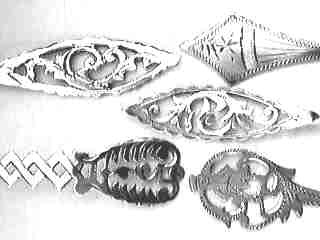 The spoon on the right of the first picture is probably an Eastern European marriage spoon. 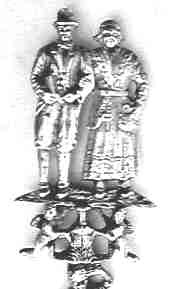 Some of these countries had a tradition of visiting the village well (see finial) on their wedding day. 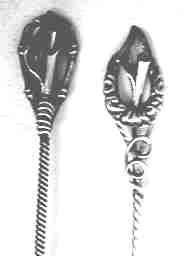 This spoon is entirely hand made, but does not have any engraving. The maker mark is very hard to read but looks like it might be Hebraic characters. 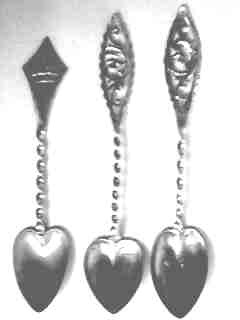 A separate exhibit of these Dutch love spoons has been created under the bon bon category. You can access the link from the main index. 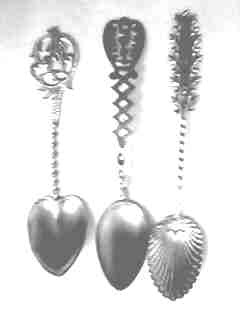 These spoons are similar to the love spoons above, except they have conventional looking bowls instead of heart shaped bowls. 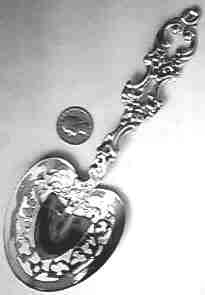 Many were given to "sweethearts", but others may be engraved with a city name, or have another design element in the bowl. 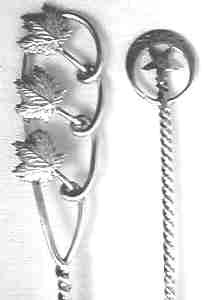 A twisty vine handle with an applied leaf and grape cluster. 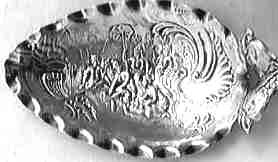 The bowl is engraved to "Rhoda"